Russ and I have talked about visiting St. Augustine for quite some time. When we started planning our trip back North, we decided that was the perfect time to explore St. Augustine. Since we booked our campground in Jacksonville, we knew we would need to maximize our time during our visit to St. Augustine. On Monday, we headed about an hour South to the old city situated on the Mantanzas River. While the list of things we were interested in checking out was quite lengthy, our time frame and desire to not bust the budget were both limiting factors. Even though we are exploring new cities, we have to remember that we are not on vacation! We decided on a self-guided walking tour. We purchased the tour for $4.95 which was a document we downloaded that included information and directions to 40 of the hot spots in the “Ancient City”. Our first stop was Castillo de San Marcos which is the oldest masonry fort in the United States. It was originally built by Spain in 1672 as a replacement for nine wooden forts. This is where we learned our first thing of the day - coquina? Coquina is ancient shells bonded together to form a material that could be compared to limestone and is the primary material used to construct the masonry star fort. Through name changes, 205 years of military use, and under five different flags - the Castillo de San Marcos still stands and is operated by the National Park Service. Thanks to our National Parks Pass (great Christmas present from Mom & Dad) this was a free activity. From Castillo de San Marcos, we walked along the river to the Bridge of Lions which spans the intercostal waterway and connects St. Augustine to Anastasia Island. The two lions are replicas of the Medici & Vacca lions in Florence, Italy. The marble lions are named Faithful & Firm and guard the city on the downtown side of the bridge. The bridge has long been a symbol of the nation's oldest city, spotted on many picture-perfect postcards! Next up was the statue of this famous guy - Ponce De Leon. He is kind of a big deal around here, but big he was not - standing at just 4’11” tall. While it is debatable where he actually made landfall on April 2, 1513, St. Augustine likes to claim the Spanish explorer as finding this part of Florida first! Next we enjoyed learning more about the St. Augustine National Cemetery and the Gonzalez-Alavarez House which is commonly referred to as “The Oldest House”. The house dates back to the early 1700s constructed of coquina. There is that new word again! We are getting so smart. With a walk down Aviles Street, deemed the oldest public street in the country appearing on maps as far back as the 1570s, we caught a glance of the Public Market, Cathedral Basilica, & Flagler College. Flagler College may have been the highlight of our St. Augustine walking tour. We were both amazed by this impressive structure. 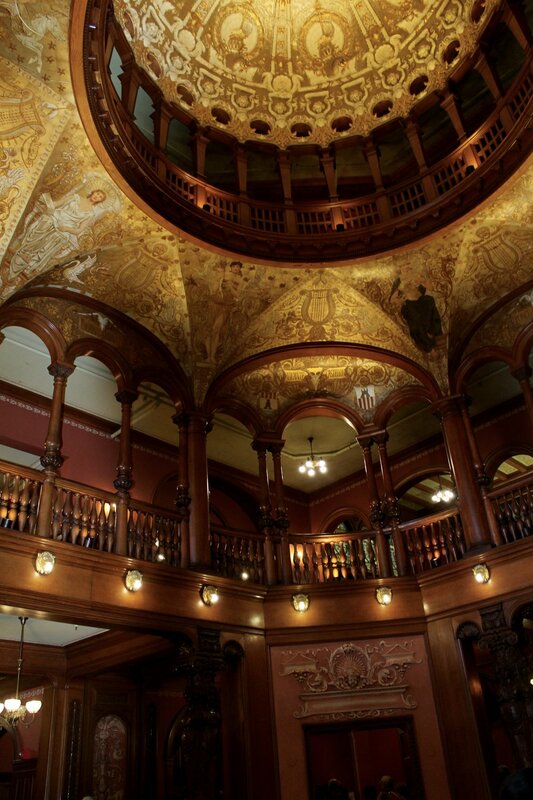 Originally the Ponce De Leon Hotel, built between 1885 - 1887 by railroad superstar, Henry Flager. It was a luxury hotel which hosted wealthy guests who traveled via Flagler’s East Coast Railway. It was the first structure in the U.S. to be built of concrete poured on site and one of the first wired for electricity and also the luxury of running water. In 1968, Flagler College, a private liberal arts school, made this building home. Just with a walk into the courtyard and lobby we were overwhelmed by the the quality of materials and craftsmanship. We really enjoyed seeing it being repurposed and used as a college. What a magnificent structure to call both your classroom & dorm - lucky students! All these old, fantastic buildings were made us hungry, making lunch our next stop. With the help of the Find MeGluten Free app, we found ourselves browsing the modern menu of locally sourced Southern grub on the porch of The Floridian. A place that supports local growers & producers gets an “A” in my book, but once our meals arrived, we added the + to that grade. I enjoyed a Floridian style Cuban of pulled pork, spicy mustard, and house-pickled veggies. Russ noshed on fresh flounder over pan-seared cheesy polenta cakes with herbed ricotta & sautéed veggies. Somehow we passed up the appetizers that were calling our names. Highly recommend The Floridian for its quaint setting & atmosphere blending with a menu bursting with flavor. We still had half of the city to explore, so we set off on St. George Street which is a pedestrian only thoroughfare lined with shops, galleries, and eateries. This part felt just a little too tourisity for us, but we made sure to snap a photo of the Oldest Wooden School House. Before heading back home, we decided we wanted to set our eyes on the Atlantic with a side trip to Anastasia Island. Heading over the Bridge of Lions we took a quick tour of the 14-mile long, 1-mile wide barrier island. While we didn’t pay a visit to the St. Augustine Lighthouse, it is open for tours and features a small museum. One of those things to check out next time. With a wave both hello and goodbye to the Atlantic, we headed back home after a lovely day exploring the Oldest City in America. Or should we say the oldest continuously occupied European-established settlement within the borders of the continental United States. Now that’s a mouthful for you, but historical accurate nonetheless. While we did our best to soak in all the sites and sounds of the St. Augustine, we didn’t come close to seeing or doing it all. If you have time to explore St. Augustine, we would like to share with you some other recommendations we received from our readers. If you check them out, we would love to hear from you….